More than 200 Alaskans gathered outside of U.S. Sen. Lisa Murkowski's office in downtown Anchorage on Monday afternoon to protest President Donald Trump's choice of Michigan billionaire and school voucher advocate Betsy DeVos for education secretary. Demanding that Murkowski vote against DeVos, protesters stood outdoors holding signs and chanting, "Stand up for Alaska," "Public funds for public schools," "Lisa, you know better," and "We need educators, not billionaires." 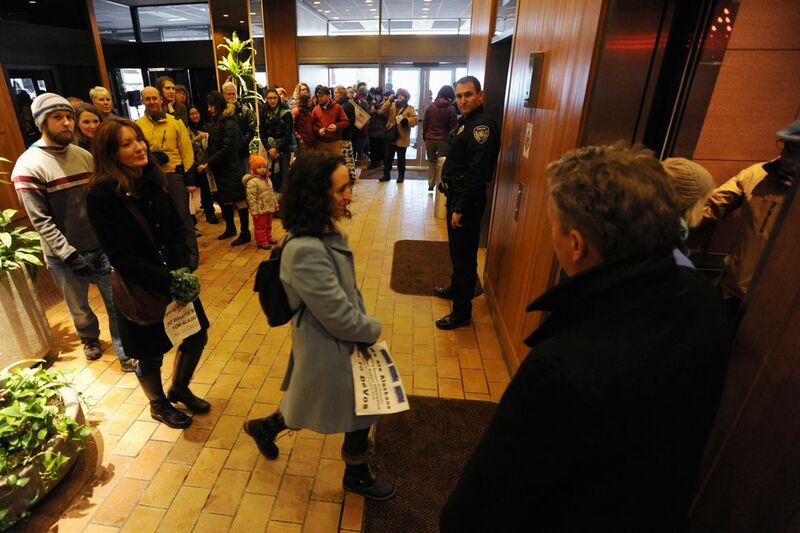 Many also stood in a line that snaked inside Peterson Tower on L Street, waiting to take one of the elevators six floors up to Murkowski's office where they wrote down their comments to the Republican senator. "Do not approve Betsy DeVos as secretary of education," wrote Cindy Farrens, 62, who drove in from Wasilla Monday for the protest. "She will not support public (free) education. Our country is strong due to an educated (populace)." Monday's protest came ahead of a Senate committee's vote on DeVos, scheduled for Tuesday morning. Murkowski sits on that education committee and said in an interview Monday night that she was still undecided on how she would vote, both in committee and if the DeVos nomination advanced to a full vote on the Senate floor. Murkowski said she had concerns about DeVos and had spent more one-on-one time with her than any other cabinet nominee, ever. She said she continued "to press on issues that not only I have concerns about but that Alaskans have conveyed to me." "This has been a hard one for me," said Murkowski, a former Anchorage PTA president. "And believe me, I have had a lot of people talking to me about the good parts of what Mrs. DeVos has done and those who have said, you know, she lacks what we need." Murkowski said her offices had received an explosion of calls in the past week, almost entirely about DeVos until Sunday night when calls started to come in about Trump's immigration ban. In total, her staff estimated that about 30,000 calls came into the office over the last week, but it was impossible to break down how many calls came from Alaskans and how many from residents of other states. "It's just been overwhelming," she said. "We've never seen a level of calls like this ever." Alaskans at the protest Monday said they wanted Murkowski to take a hard stand against DeVos' nomination. Some said DeVos lacked experience in public education and was unqualified to take the helm of the country's public education system. Some said they worried what DeVos' support for voucher programs would mean for Alaska, where many rural villages have barely enough students for a single public school, let alone commercial competition. 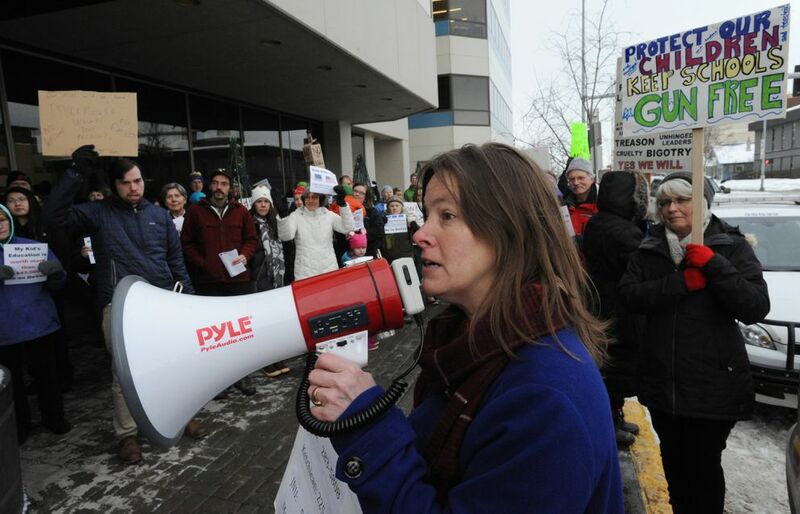 "She has no experience with public schools, that's number one," said Becca Bernard, a member of Great Alaska Schools, a nonpartisan coalition that advocates for public education and helped plan Monday's protest. "Number two," Bernard said, "is that she's been a strong proponent of allowing public money to go for private schools. Obviously that's a problem because public schools are underfunded already." 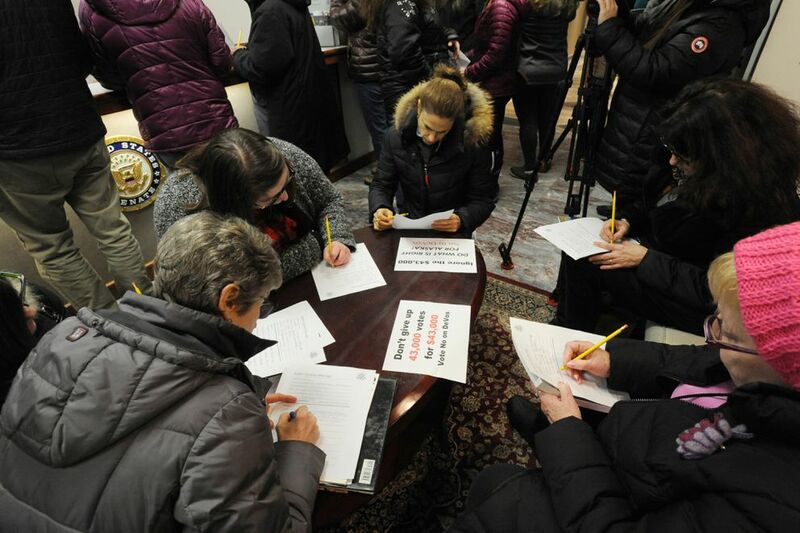 Organizers from Great Alaska Schools said 171 people signed in at the protest Monday, though they estimated that only half or two-thirds of those present signed attendance sheets. 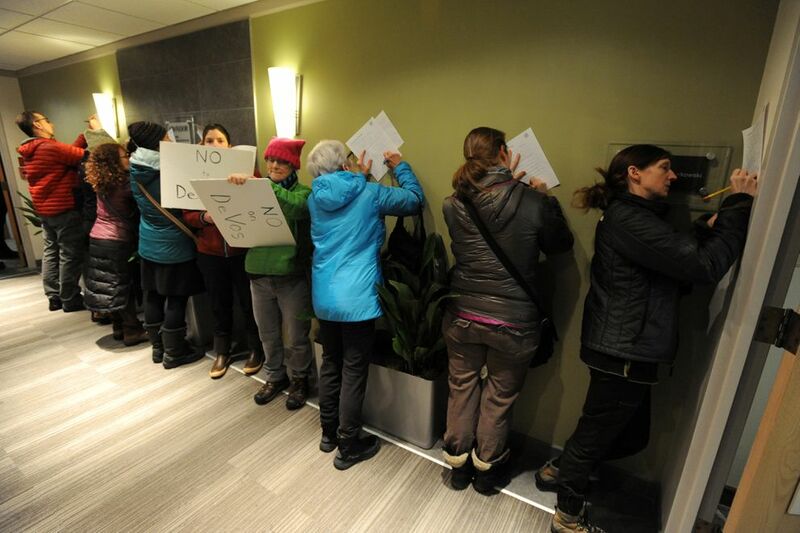 Staff at Murkowski's Anchorage office would not provide the total number of public opinion forms filled out Monday afternoon during the hourlong protest. Kyle Pace, 26, of Anchorage, said he hoped to have his voice heard Monday, holding a sign asking Murkowski to vote against DeVos and Sen. Jeff Sessions, R-Alabama, Trump's nominee for attorney general. "I feel like the only way it will be heard is if I keep standing up and I keep speaking out," said Pace, a university student and waiter. In an education secretary, Pace said, he wanted someone who had attended public schools and had experience with public schools — both qualifications, he said, that DeVos did not meet. Similar protests over DeVos' nomination have been held in cities across the country in recent days, including in DeVos' hometown of Holland, Michigan. The National Education Association in Alaska has also asked people to sign a letter telling Murkowski that DeVos is the wrong choice for public schools and for Alaska students. "She's never taught, she's never worked or even attended a public school," said NEA-Alaska President Tim Parker in an interview last week. "That's giving people a lot of pause over whether she's qualified for this position."